The WOC Middle Distance has seen reasonably solid performances by all 4 Kiwis with Lizzie Ingham leading the way in 24th place in the women’s race, Kate Morrison 43rd, and Tim Robertson and Toby Scott close together in 48th and 52nd in the men. Toby as fourth starter had no benefit from the tracking that developed later on, but had an essentially clean run with the only clear errors, apart from moments of uncertainty in the technical and rocky terrain, being at number 5, and pulling up slightly short at the final control. Nevertheless he had the honour of taking the early lead and gaining the privilege of lounging for a while in the comfy chair on the stage reserved for the current leader. Sadly it didn’t last! In contrast Tim described his run as a being a bit scrappy, starting with an error on the first control, where he was too low on the slope, and then following this with a mistake on number 3. Ultimately, his time of 46:26 was 44 seconds faster than Toby, and some 9 minutes off the pace. Like Toby, Kate had a relatively clean run with no obvious mistakes until venturing through an uncrossable marsh en route to the last control, and was generally happy with her performance. Lizzie, starting some 5 hours after Toby, like Tim, rued a mistake on number 1 which she attributed partly to tripping over a TV cable somewhere between the start triangle and the control and momentarily losing concentration. 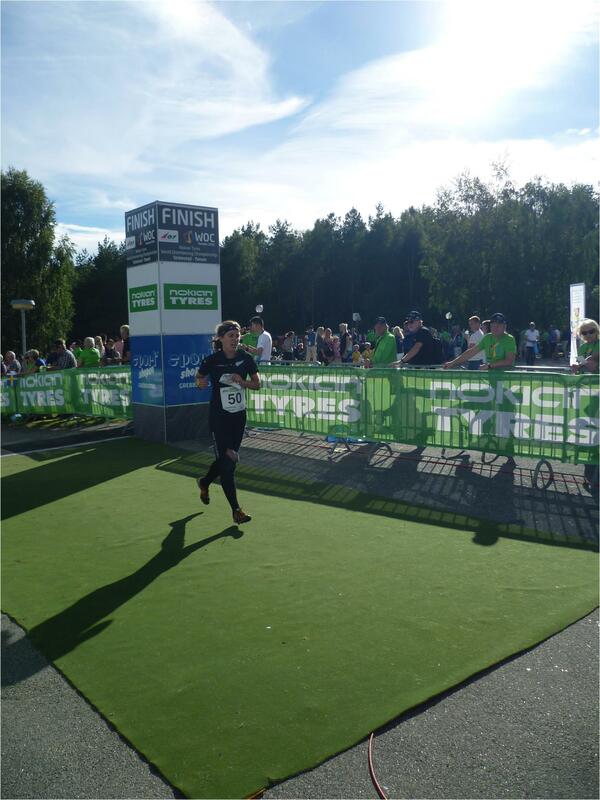 She also suffered a few small wavers around controls with her final time of 38:36 just over 4 and half minutes down, Kate being a further 5 minutes back. To the delight of the home supporters Tove Alexandersson, after almost innumerable second places, finally won her first World Title with a 35 second margin over Norway’s Heidi Bagstevold, and a further 13 seconds ahead of Russian Natalia Gemperle. However, possibly the biggest cheers were reserved for Emily Kemp of Canada who was only edged out of the emdals into fourth place as Alexandersson, the last starter, finished. In the men’s race it was a day for the Swiss, with Matthias Kyburz taking the title and Daniel Hubmann coming in third, the pair of them sandwiching Olav Lundanes of Norway, and keeping perennial favourite Thierry Geourgiou out of the places. Following today the women have now moved up to 5th place in Group 2 (out of 14) and only 18 points away from Ukraine in 3rd. The men are not quite as well placed but have a handy points margin over Spain, Belaruss, Italy and Germany behind them. Equally important, with the Middle distance and sprints behind us NZL is mor ehighly ranked than Australia and this hsould see us have at least some representation at next year’s World Games in Poland.